Celadrin® is considered an aide to joint mobility and flexibility. Celadrin® is believed to work in a similar way to the essential fatty acids from fish oil in providing support during the inflammatory process. Celadrin® induces changes at the cellular level and positively affects the responsiveness of the cell membranes thus protecting them from the action of the inflammatory immune messengers. This Vegan Celadrin® is from plant based sources with oils including; palm, palm kernel, olive, nutmeg, coconut and unsaturated vegetable oils. The oils go through a process of hydrolysis, distillation and finally esterification prior to encapsulation and presentation to the market. For those with on-going inflammatory reactions the benefits of Celadrin® have many positive anecdotal reports. Trials also demonstrate positive outcomes with improvement in motion and function of joints including knee, elbow, wrist and hands. 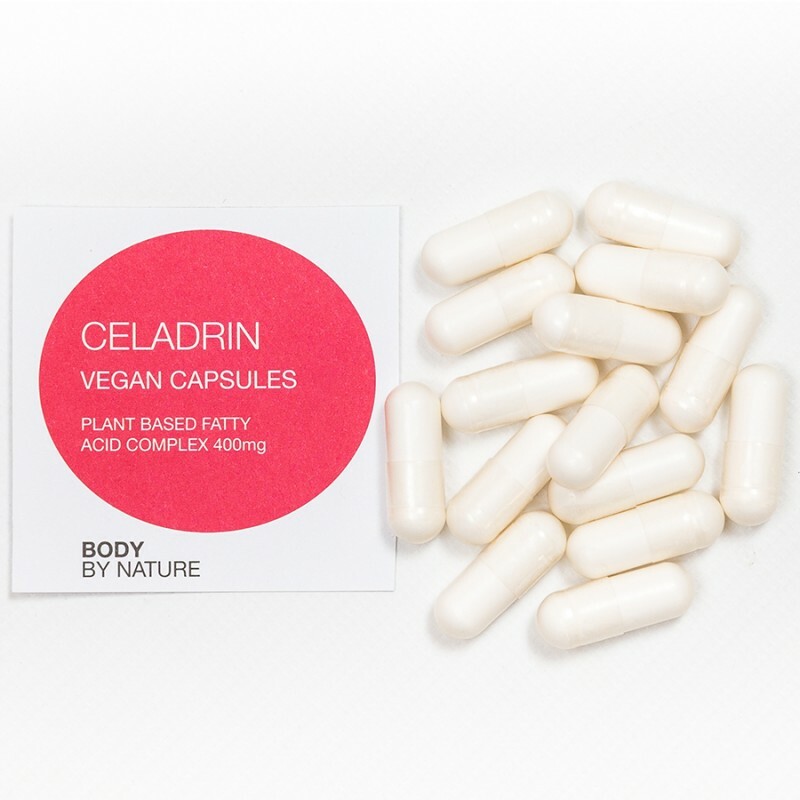 Celadrin® products available previously were obtained from bovine sources which restricted its use for vegetarians and vegans. In addition the fact that it was an animal based product with concerns for the source has limited its popularity. This new plant based source of Celadrin® has a fatty acid complex identical in structure to the bovine form and research shows it to be equally effective. Inhibits inflammation in endothelial cells, reduces the production of the immune factor Interleukin 6 (cytokine) and controls the tumor necrosis factor alpha responsible for inflammation. Is supportive of the lubrication of affected joints. Inhibits arachidonic acid, one of the main promoters of the inflammatory cascade of immune factors by inhibiting 5-lipoxygenase another mediator of inflammation. Provides added protection to the reduction of cartilage breakdown in joints. Modifying ‘inflammatory mediators’ is a key protective factor for joints - thereby reducing the destructive tendencies of inflammation to bone and cartilage and helping to maintain healthy flexible joints. Vegetarian and vegan suitable Celadrin® is a patented combination of special cetylated, esterifed fatty acids containing: Cetyl myristoleate, Cetyl myristate, Cetyl palmitoleate, Cetyl laureate, Cetyl palmitate, Cetyl oleate. We would suggest that Celadrin® is included with the dietary guidelines and supplement support for those with inflammatory symptoms impacting on joints. Celadrin® may be used in conjunction with Fish Oils, Glucosamine and existing inflammation support nutrients. All these can be bought from our other pages. A small scale trial has shown Celadrin® may assist symptoms for those with psoriasis of the skin by reducing skin inflammation and providing an emollient effect at the site of psoriasis. Following the topical application of Celadrin® an increase in skin permeability and improvement in roughness and thickening of the skin was recorded; the skin was found to be firmer and better hydrated. Celadrin oil base (esterifield fatty acids of plant oil, from palm, palm kernel, olive, nutmeg, coconut and unsaturated vegetable oils), capsule shell (hydroxypropylmethylcellulose). Adults and Children aged 12 years and over: - 2 capsules acutely and once symptoms have improved reduce to 1 capsule per day. Take with food. Suitable for: Vegetarians, vegans, and for people with Candida and lactose sensitivities. Non GM & Free From: Dairy, wheat; starch, gluten; lactose; soy; added sugars, colourings, flavourings & preservatives.